Kitchen Cabinet Refinishing Doesn't Need To Be Expensive . . . or be a hassle! ​Wondering about kitchen cabinet painting? Painting kitchen cabinets is a quick, fast and inexpensive way to dramatically update your kitchen. We come in to remove then clean, sand and thoroughly prep your cabinets doors and drawers in our shop. Once they are ready we professionally spray a substantial coat of primer followed by an extremely durable coat of either Benny Moore Advance or Sherwin Williams Emerald Urethane. We then clean and prep and coat your cabinets right where they are without spraying. You will love the finished product. It's a great way to refinish your kitchen on a budget. Did I mention the sprayed on finish so your cabinets will look like they just came from the factory?!?! The finish is very durable, very scrubbable!! Q. do we charge more for larger kitchen doors and less for smaller? A. Not unless they are double the size of an average door. Other than that we figure it all averages out in the end. Q. how about lazy susan doors? A. that's two doors put together so we count that as two doors. Q. how about the fake drawers under the sink? A. we count those as a drawer because we take it off, bring to workshop and spray it. Q. Can you do oak or veneer? A. Yes, the majority of the kitchens we do are oak. They finish up beautifully!!! Q. Can you do cabinets with therma-foil doors? A. Yes, they finish up great! Q. Can I choose any color I'd like for the refinishing? A. We stock a few whites and grays. Anything else would be a custom color which is a nominal upcharge of $75. A. Yes. 50% down before we start and the remainder due on completion. A. Yes, we do however there is a 3% upcharge on that as that's our extra cost. A. Yes, we are fully insured and carry workers comp on all of our employees should someone get injured on the job in your home. We are also licensed with the state of Michigan. An alterations & improvements license is required in the state of Michigan to paint in your home, no matter how small or large the project. PLEASE NOTE: we will do your bathroom or laundry room for you but ONLY at the same time we are doing your kitchen. 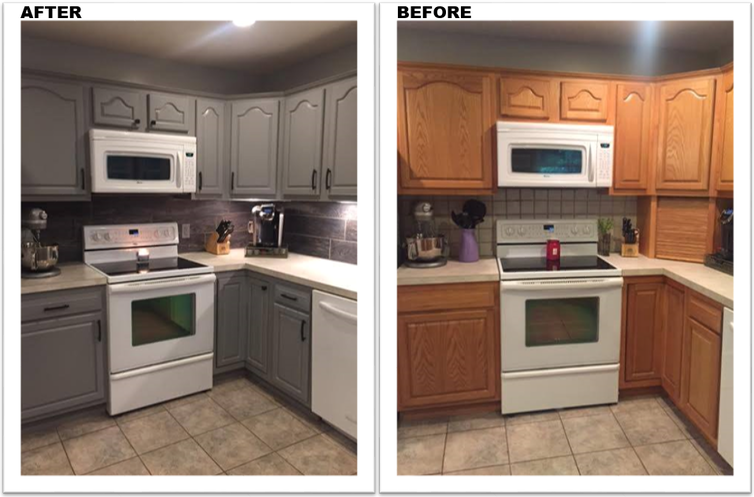 AREAS WE SERVE: We are primarily based in Jenison and will go out 25 miles but we also have painters in Grand Haven/Muskegon area so we will now also paint your kitchen for you in that area. With 16 ladies as part of the team we can usually get to your project in a reasonable amount of time, usually within 2-4 weeks.